This is a heavy post. My grandfather is dying right now. 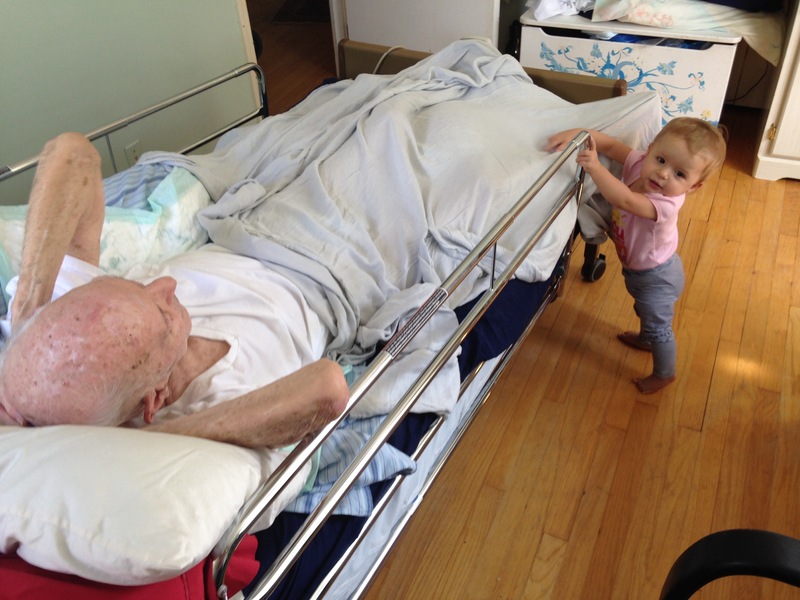 He is 93 years old and he’s in a hospital bed in my old bedroom in my parents’ house down the street. We have been keeping vigil by his bedside for the past four or five days, never leaving him alone for more than a few minutes at a time. Days ago we thought that he surely wouldn’t last another day, another hour, but the body that has worked well for almost a century is not willing to give up so easily. It is heartbreaking to watch, emotionally draining and depressing. We know that he is going to heaven and that he has wanted to go to heaven ever since my grandmother died five years ago, but it is still painful to watch the transition. I keep thinking about Lucy and my three babies on earth. Liam, Asher and Nora will all die one day and I probably won’t be here to make sure their transition to heaven will be as comfortable as possible. This is a distressing thought. Will my babies be well loved in their last hours? Will they be scared? Will they be in pain? My Daddy-D, he is somebody’s baby boy, and that’s how we are treating him…the way we want our children to be treated when they die. Nora and Daddy-D have had a special bond, especially these last few days. She loves sitting on his bed next to him, patting him and babbling at him, even saying his name. His face would light up when he saw her in the last few days that he was aware and still in control of his body. Nora gives love pats while my sister moistens and cleans Daddy-D’s mouth. She played peekaboo with him, touched his nose, laid her head on him, and all I could think of was Lucy doing the same things with him soon, in heaven. How long until he goes from playing with my daughter Nora, to playing with my other daughter Lucy? Days? Hours? Minutes? And he will get to know her before I do, my own daughter. How do I process this? 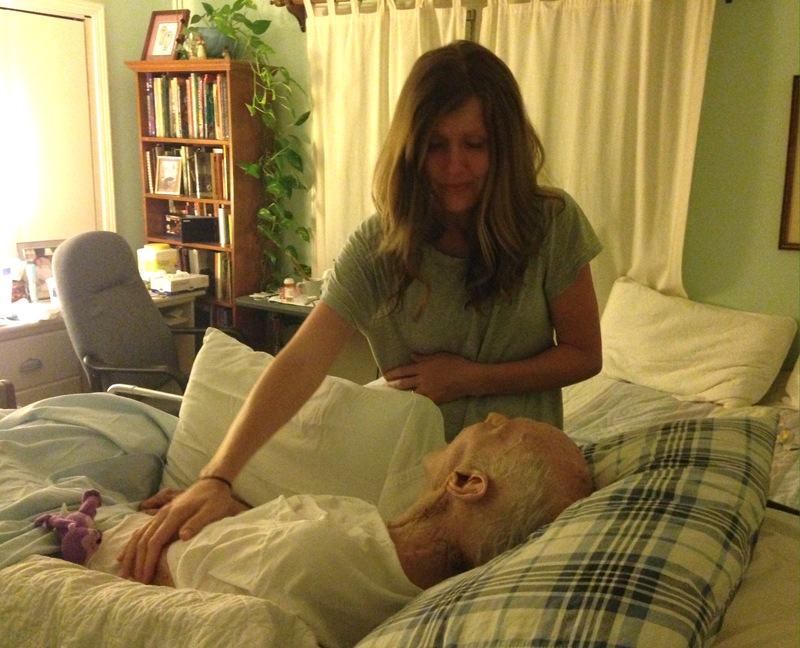 As he has slowly deteriorated and faded, we have been speaking more about the people who are waiting for him in heaven. My mom encourages him, “Mama is waiting for you, Daddy! She can’t wait to see you!” He seems at peace most of the time. I have to mention Lucy…”And you will get to see Lucy soon, Daddy-D! Tell her…” What do I say? What kind of words can I send with him that can adequately convey my love to her, my ache for her, my inability to live without her here? There are no words in the English language powerful enough to express how I feel about her. “Tell her that Mommy loves her and misses her so much. Tell her about her sister and her brothers. Tell her how fun it was playing with her baby sister. I’m jealous that you get to go meet her.” The words are limp. Not enough. He can’t really move but his eyes fill with tears and the tears spill out the sides, running down his face. He tries to speak but we can’t understand what he wants to say. 1 Corinthians 15:55 Where, O death, is your victory? Where, O death, is your sting? I know that Jesus conquered death, but these words don’t feel true because death seems so much bigger at the moment. Looming, mysterious, inescapable. None of us are getting out alive. I feel weighted down as he struggles to breathe. THIS is the best case scenario? One day, we will all be dead. I ask God for His perspective, for His light to brighten our darkness. And He gives me thoughts that comfort: Death is inescapable, but for those who love God and believe in Him, it is only a tiny slice of time; a moment. It doesn’t define us, it isn’t the end, it is just a transition we all have to go through. For those of us who are left behind, death is a separation from the people we love, and that is why I hate it. For those who are dying or have already gone ahead, death is a link to the people we love, and that is why I appreciate it. Yes, death is real and it affects us all, but there is also SO MUCH LIFE. Daddy-D experienced so much life. He lived for 93 years! When my mom was a tiny girl he promised her that he would tell her he loved her every single day, and he did. He kissed her and doted on her and told her she was beautiful and she believed him. He loved his wife and his kids and his grandchildren well. He loved God and was faithful to Him. Daddy-D was a leader, a WWII veteran, a successful engineer and he LOVED giving advice. When we were younger he would say, “Look at my old, wrinkly face. Would you swap faces with me? No? What if I gave you ten dollars, would you trade faces with me then? No? What if I gave you a million dollars, would you trade faces with me then? No? Then you are a millionaire right now, at this very moment.” And I felt like a millionaire. He often reminded us, “Deciding to follow God is the most important decision of your life. Deciding who to marry is the second most important decision you will ever make.” I could write so much about his life, but the point is that he LIVED. And after his last breath, when his life here on earth comes to an end, there is more life. Everlasting life stretches out ahead of him. Thank you, Jesus for this gift. What if we could see death for what it really was? Just a thing we all have to get through, like puberty, or winter (or summer if you live here in Alabama.) It does not loom, it does not define us. THERE IS SO MUCH LIVING TO BE DONE, before death and after. Having this assurance brings the most amazing peace, even here in the valley of the shadow of death. If Daddy-D could tell you one thing right now as his time on earth dwindles, I know he would ask, “Have you made the most important decision of your life?” Because that decision is what defines your eternity, and when you accept the free gift of life that Jesus offers, you rob death of it’s power. Romans 10:9 If you confess with your mouth that Jesus is Lord, and believe in your heart that God raised Him from the dead, you will be saved. I love you Daddy-D. Give Lucy so many kisses for me.